Get road trip ready with these ideas to get ready your car and create a car kit for the adventure. Springbreak is around the corner and having the kids at home (those Springbreak camps are amazing..ly expensive!) is one of those things that can be a bliss and a real nightmare: too much fighting with one another, too much screen time, too much doorbell ringing from the neighborhood kids, too unpredictable weather… That is why I try to schedule some time off during the day from my work responsibilities to take Mini (and the occasional friend) to some of the places I always want to go with her when she’s at school. On the other hand, we as a family love to visit nearby towns where the range of activities goes from strawberry picking at a farm to beach walks or snowmen building. Yes, California is a true paradise for road tripping and I am decided to do it even more often in the following months. The diverse landscape is breathtaking and, as Earth Day is coming, I want to teach my kid to enjoy our planet as much as she can. I am sharing this ready-to-go checklist to help have peace of mind easier for anyone who is organizing a road. If you follow it, you will travel assured knowing nothing important is left behind. Here is my selection of VIT (Very Important Things) to keep in consideration before, during and after a road trip. Clean up your car seats and trunk. Yes, you need to make space for luggage and people. Vacuum the seats and car floors, wipe any surface that can be wiped (board, display, wheel, cup holders) and get rid of any trash from past days. Road trip tip: Use cupcake liners inside the car cup holders to keep them clean. Set up any extra space area you think you might need. Like a car roof basket for extra storage or a bike holder (although this device usually requires being installed once you don’t need to open the trunk again). Road trip tip: Shower caddies can be used as food trays for on-the-go meals. Give your car a mechanic check-up. I am talking about the whole enchilada kind of check-up: tires’ pressure, brakes, and all the fluids that it needs to work properly: anti-freeze, water, windshield washing liquid. 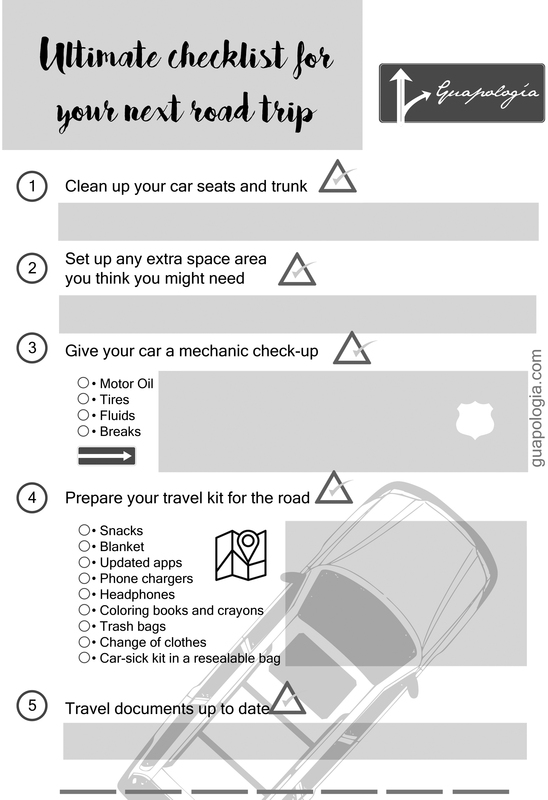 Road trip tip: Pay special attention to the motor oil levels and if there is the need for changing it. For this one, I have been using Mobil 1™ synthetic oil because it protects more than just the car engine and can be purchased on-shelf at Walmart. Even better, until April 30th, 2018, Mobil 1™ is giving Walmart customers a chance to win a Chevy Equinox, plus $10 off their next Mobil 1™ purchase at Walmart. Read below for all the information regarding this promotion. Trust me on this one: you really want to know the details (hint: It is a very cool promotion)**. To make it even easier for you, Walmart’s Auto Care Center is a great place to get your oil changed for any road trip (or else) you are planning. It is so important to recycle motor oil properly! It can contaminate water and soil -which we really don’t want to happen-. Bring your car for an oil change at Walmart’s Auto Care Center, where they will take care of it for proper recycling while getting another chance to enter to win the sweepstakes. Prepare your travel kit for the road. Snacks that are easy to open and do not come with any sort of dip or liquid that can drip all over the place, a blanket, updated apps like Roadtrippers Trip Planner, Google Maps or Waze, gas buddy, favorite podcasts – we like StoryNori for kids and the TED Radio Hour for all family members- and music playlists that compels everyone’s music preferences, car games like Would you Rather and Car-tegories. Also include some coloring books and crayons, a couple of tablet/phone chargers, headphones for any necessary unplugging from family life, plastic bags for trash, and a readily available change of clothes (including outwear). Road trip tip: also, include a car-sick emergency resealable bag filled with any OTC motion sickness medication, ginger candies -the flavor might not be as delicious as regular candies but ginger helps with nausea-, a bottle of any sport’s drink, hand sanitizer, a supply of folded kitchen towels, a travel-sized package of disinfecting wipes and an extra plastic bag for any nausea-related emergency. Check out all your travel documents are up to date. Double check your car insurance is renewed, that you have your car registration card where you can find it easy, and your medical insurance information is easily available for anyone to find it. If you plan to cross any international borderline don’t forget to keep at all times with you your passports and any other accreditations you might need. Road trip tip: I usually snap a picture on my cell phone of all my confirmation emails and any important information I might need just in case the internet is not working properly. By purchasing 5 quarts of Mobil 1™ in the store or a Mobil 1™ oil change at the Auto Care Center. By recycling any used oil at any Walmart Auto Care Center. As a bonus, shoppers that purchase 5 quarts of Mobil 1™ synthetic oil or a Mobil 1™ synthetic oil change at the Auto Care Center are also eligible to receive a $10 Walmart Select Certificate valid on any future 5 quartz Mobil 1™ purchase at Walmart. Once shoppers have made a qualifying Mobil 1™ purchase or recycled any used oil at Walmart, they can enter to win the Chevy Equinox and/or receive their $10 Walmart Select Certificate at earthdaydriveaway.com. Limit 2 entries in the sweepstakes per customer (1 for purchasing and 1 for recycling). The receipt will be required to receive $10 Walmart Select Certificate. Not sure of how to choose the right product for your car needs? Try the Mobil 1™ Oil Selector Tool! You can use the Oil Selector tool on Walmart.com to determine what type of oil you will need. CLICK HERE to use this tool.